Built the bikes in Changi Airport - hopefully the last time we wait with baited breath to see in what state the boxes come off the oversized baggage conveyer as technically, from here, we can pedal home with out the need to fly. The airport is efficient, quiet and clean, like most of the city, and felt a million miles away from where we’d been recently. We engaged in a half hearted argument with security staff who said we couldn't cycle out of the airport, eventually sneaking round the corner and asking an open back truck to run us 2km down the road. From there we breezed into the city on a smooth wide cycle path, the sea and it's army of container ships to our left. It was Sunday and Singaporeans were out having lots of organised fun, keenly demonstrating the use of an array of personal mobility technology. It felt novel asking for directions in English. 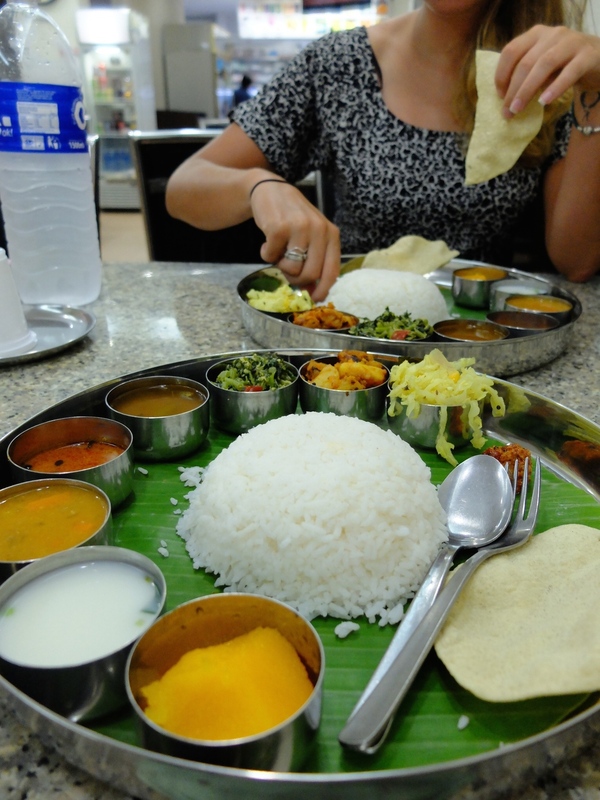 Singapore is a fantastic mix of Malay, Indian and Chinese, so the variety of food on offer had us very excited. In a city of designer shops and high end restaurants the hawker centres are very good value make for a great atmosphere. After two helpings of rice and curry, we found our host for the first couple of nights and learnt there was a 4th birthday to be celebrated. We were charged with eating cake and playing lego - fine by us. Needing to find a place for Luke to do a few days work we headed to a hostel run by a chap called SK. Offering a 50% discount for cyclists the Tree In Lodge was tiny, very homely and a crossroads for overland travellers. 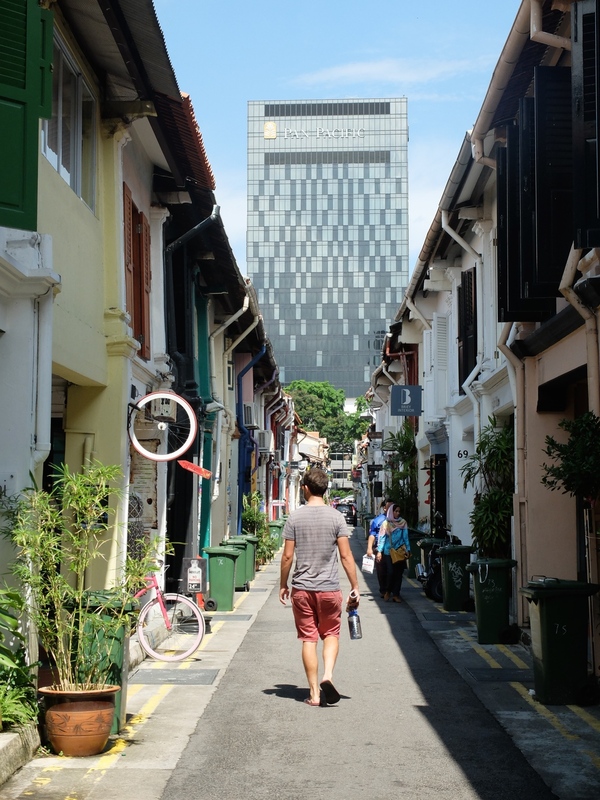 SK himself has cycled from Europe to Singapore and along with the rest of the guys there was a font of knowledge and advice, modestly answering all our questions on trans Asia routes, visa issues and kit. We stayed 5 days and left with a much better idea of what lay ahead, as well as three half used Schwable Mondial tyres ditched by some Germans going the other way. Unexpectedly awesomely, Luke’s birthday was celebrated with cold beers in Holly and Rhsys' rooftop pool. Flora and Holly went to QEGS together and we gladly accepted the invitation to spend our last few very relaxing days at their place. If Penrith lies at 2° longitude West, then at our furthest point East in New Zealand we were between 179° and 180° from home. In Singapore we are exactly 100° from home and crossed over the equator mid flight, with nearly 8000km pedalled.